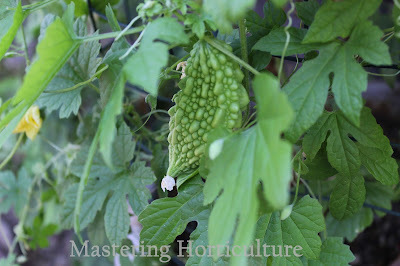 One vegetable vigorously growing in my garden at this time in the season is the bitter gourd (Momordica charantia L.). This vegetable was a part of my everyday diet in my earlier years. Sadly, it has increasingly become a rarity since I moved to California. But this trend is soon to be reversed. 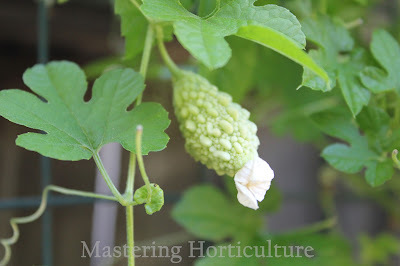 With my success this year, bitter melon may yet become a regular item in my summer garden. Bitter melon is an important vegetable crop in the Philippines and all of Asia. The fruits and leaves are edible - both bearing a strikingly bitter taste that varies in intensity depending on variety. In my village, bitter gourd is believed to be purgative. Newborn babies (before their first taste of their mother's milk) are given a teaspoon of bitter melon tonic - pure extract from the leaves of the plant. This blackish-green delight is bitter enough to squeeze every facial muscle of the infant. As if this is their initiation into the world. However, this does not diminish the fact that bitter melon is an acquired taste even to Filipinos. For my grandmother, the more bitter the parya (Ilocano word for bitter melon) the better it is. But to my grandfather, parya and food did not go together. In the bigger world, bitter melon has gone a long way. Extensive research has led to understanding the medicinal properties of the plant down to molecular levels. Bitter gourd has emerged to be one of the most significant botanical remedies for type 2 diabetes. Recently, AVRDC - The World Vegetable Center spearheaded a project called the Bitter Gourd Project which "aims to improve the incomes and health of the poor in developing countries, particularly the quality of life of diabetics, through scientific research on bitter gourd (Momordica charantia L.)." But as for me, bitter gourd or bitter melon is just one of my favorite vegetables in the world. Now let's talk about the plant. Bitter gourd is tender perennial - in this area it is treated as an annual plant. 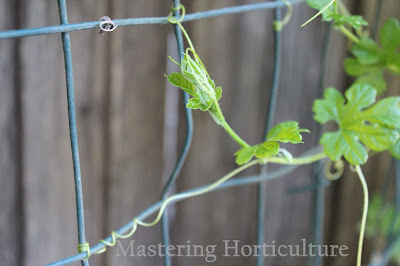 The vine grows eight to ten feet in length with robust branching and foliage growth. 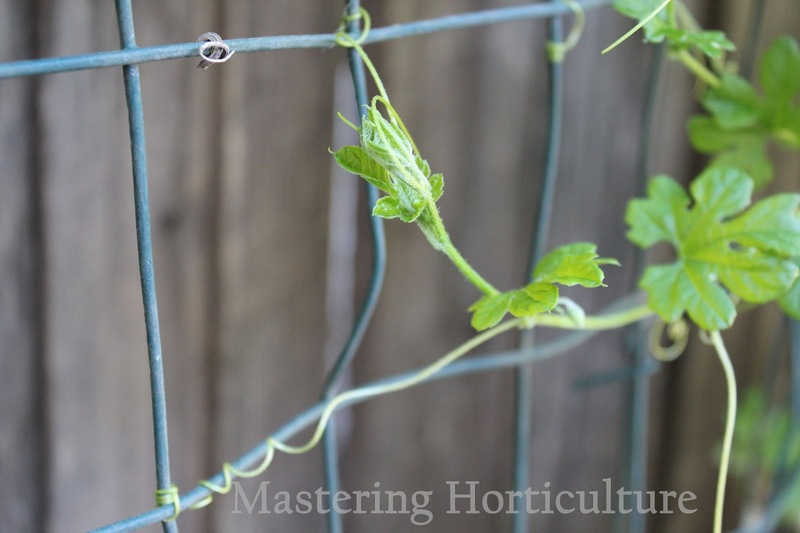 It looks delicate but its every node bears a tendril that allows the plant to secure itself easily on trellises or other plants. The palmately lobed leaves are beautiful. The flowers are bright yellow and very fragrant. 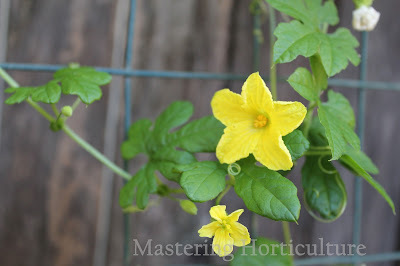 Just like all other plants in the Cucurbitaceae family, the bitter gourd is a monoecious plant - having separate male (staminate) and female (pistillate) flowers on the same plant. Only the pollinated female flowers turn into fruits. Fruits of bitter gourd are generally warty with colors ranging from dark green to white. They can be small and rounded (one-inch diameter) to large and elongated (3-inch diameter and 15-inch long). 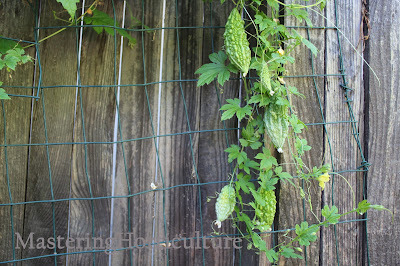 The plants growing in my garden have small and elongated fruits with an average length of 3 inches. Choose sunny location - afternoon shade in hotter climate like mine. Bitter gourd can be grown directly into the soil or in containers. Mine is growing in a five gallon bucket. Incorporate compost or decomposed animal manure into soil. 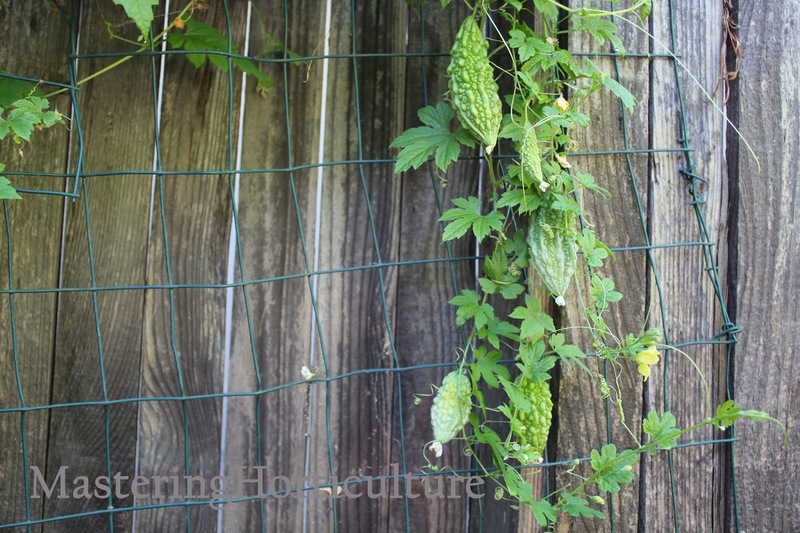 Plan and install support structures for plants (I attached wire mesh on the fence but you can used bamboo stakes or trellis). Direct sow plants in warm soil after the last frost. Water the seeds thoroughly. It takes about a week for seeds to emerge. Protect seedlings from snails and slugs - I've learned it the hard way. Water regularly to keep soil moist but not wet. Mulch to conserve soil moisture and reduce weed growth. Fertilize bitter gourd when there are two tendrils stretching out of the stem. Repeat every two to three weeks. Yellowing of the leaves can be a sign of nutrient deficiency. Remember: Low-dose fertilizer applied frequently is better than high dosage at a less frequent interval. Check for pest and diseases regularly. Harvest fruits when they are green and shiny. When fruits begin to turn yellow then it is too late. Have you ever grown bitter gourd in your garden? And have you eaten bitter gourd before? What did you think?